It is duty of court to frame issues from material propositions. To frame issues, court is to find out questions of fact, questions of law and maxed questions of fact and law from pleading of parties and other materials, which are produced with pleading. And parties are to produce their evidence to prove or disprove frame issues. “A single material point of fact or law in litigation that is affirmed by one side and denied by the other and that subject of the final determination of the proceedings”. Court should only frame issues when defendant has made his defense against suit through submission of his written statement. However, court should not frame issues when defendant has not appeared before court and, therefore, has not made his defense through submission of his written statement. Material proposition are those propositions of law or fact which a plaintiff must allege in order to show a right to sue or a defendant must allege in order to constitute his defense. The object of framing issues it to ascertain the real dispute between the parties by narrowing down the area of conflict and determining where the parties differ. It is the duty of the judge himself to frame proper issues. Where parties are not satisfied, it is their duty to get proper issues framed. The court shall read the plaint and written statement before framing an issue to see what the parties allege in it. Order 10 Rule 1 permits the court to examine the parties for the purpose of clarifying the pleadings, and the court can record admissions and denials of parties in respect of an allegation of fact as are made in the plaint and written statement. If any party admitted any fact or document, than no issues are to be framed with regard to those matters and the court will pronounce judgment respecting matters which are admitted. The court may ascertain, upon what material proposition of law or fact the parties are at variance. The court may examine the witnesses for purpose of framing of issues. The court may also in the framing of issues take into consideration the evidence led in the suit. Where a material point is not raised in the pleadings, comes to the notice of the court during course of evidence the court can frame an issue regarding it and try it. Under this rule any person may be examined and any document summoned, for purposes of correctly framing issues by court, not produced before the court. The court may frame the issue from all or any of the following materials. Issues can be frame don the allegations made on oath by the parties or by any persons present on their behalf or made by the pleader of such parties. Issue can be framed on the basis of allegations made in the pleadings. Where the plaint or written statement does not sufficiently explain the nature of the party’s case, interrogatories may be administered to the party, and allegations made in answer to interrogatories, delivered in the suit, may be the basis of framing of issues. The court may frame the issue on the contents of documents produced by either party. Issues can be framed on the oral examination of the parties. Issues may be framed on the basis of oral objection. At any time before passing of decree, court can amend framed issues on those terms, which it thinks fit. However, such amendment of framed issues should be necessary for determination of matters n controversy between parties. 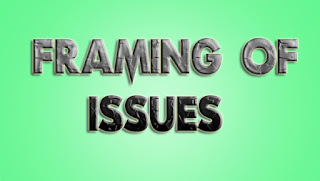 At any time before passing of decree, court can strike out framed issues especially when it appears to court that such issues have been wrongly framed or introduced. Regarding amendment of frame issues, court possesses discretionary power. Court can exercise this power when no injustice results from amendment of frame issue on that point, which is not present in pleading. However, it cannot be exercised when it alters nature of suit, permits making of new case or alters stand of parties through rising of inconsistent pleas. Regarding amendment of framed issues, court also mandatory power. In fact, court is bound to amend framed issues especially when such amendment is necessary for determination of matters in controversy, when framed issues of do not bring out point in controversy or when framed issues do not cover entire controversy. Court can amend or strike out framed issues at any time before final disposal of suit. To conclude, it can be state that issues are of great importance not only for parties, but also for court. Parties are required to prove disprove framed issue and not their pleading. On the other hand, court is bound to give decision on each framed issue. Therefore, court is not to decide those matters on which no issues have been framed.